This Rematch is complete as of 13 October 2013. Essays for the Multimatch of three Godzilla films. I'd love to start Round Three on the next page. Ha. If you'd waited just a few more minutes, I was reading your essay! This one is definitely not terrible, though, of course, I like the other one better. I enjoyed it at the time, then forgot almost all of it right after. I think its stripped-down story line works pretty well, since I found it easy to follow. Also, I'll take Vincent D'Onofrio's scenery chewing any day over Craig Bierko's constant befuddled face. I agree about Armin Mueller-Stahl saving it, though. He provides the gravity the rest of the film lacks. I agree about Armin Mueller-Stahl saving it, though. He provides the gravity the rest of the film lacks. Too bad he's done with all too soon. Well, at least he returns later in the movie as the sim. That's what I was looking for. The notion that The Thirteenth Floor lacks gravity. Thats it. Also, with several rewatches, you can see that even Fassbinder was having a bit of fun, you used the term "campy" and that might fit. This was a fun Quickmatch. Thanks for suggesting it! Also, with several rewatches, you can see that even Fassbinder was having a bit of fun, you used the term "campy" and that might fit. Oh, definitely. He was always having fun. I feel kind of bad because World on a Wire is probably the worst introduction to Fassbinder. I should have suggested The Blue Angel/Lola instead. This was a fun Quickmatch. Thanks for suggesting it! You're welcome. Thanks for doing it. I had fun! I vaguely remember enjoying the '56 version when I was like 10, but as far as I know, it's the '54 version re-edited with an American stuck in there. The '98 I didn't particularly care for, but it's been too long since I've seen it and I don't have anything interesting to say about it. Never seen the '54 film. Are there any Godzilla films that you liked, as a kid or an adult ('sides the 1956)? You're right about the '56. It was re-written, cut up, had scenes with the American added, and then it became Godzilla for several decades after that. The 1954 film was restored in 2000, I think, and has been made available in 2 DVD and Blu-ray sets. I could never understand a few things about people's reaction to the 1998 release. That's the topic of one of my planned essays. We've made it to the end of the third Round of nine Rematches. 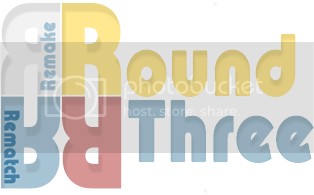 The entire project, Rounds One, Two & Three took from 11 February 2011 to 25 May 2014. In case there is some reason you'd want to see it, this links to the original 2012 scheduling post for Rounds Two and Three. 10-- Gojira vs. Godzilla King of the Monsters vs. Godzilla: Complete. 11-- The Wizard of Oz vs. The Wizard of Oz vs. The Wiz: Complete. 12-- The Philadelphia Story vs. High Society: Complete. 13-- Rollerball vs. Rollerball: Complete. 14-- The Blob vs. The Blob: Complete. 15-- King Kong vs. King Kong vs. King Kong: Complete. 16-- Death Race 2000 vs. Death Race: Complete. 17-- The Champ vs. The Champ: Complete. 18-- The Thing from Another World vs. The Thing vs. The Thing: Complete. I think the only other one I've seen is King Kong vs. Godzilla, which I saw a lot of times when I was really young. I probably enjoyed it then, but barely remember it now. I've never really gotten into monster movies as a whole, though. I'm pretty interested to see the King Kong discussion play out. The movies are available in DVD format. All are available in Blu-ray format. 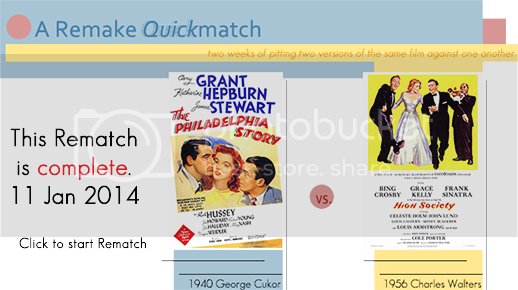 The 1954 and 1956 films come together in a Criterion box set. 1954 Blu-ray: -- this is the 2004 Classic Media release. Target -- Barnes & Noble -- Amazon. 1954/1956 DVD: -- this is the 2013 Criterion release. Amazon -- Target. -- this is the 2004 Classic Media DVD release with both films. Amazon -- Barnes & Noble. 1954/1956 Blu-ray: -- this is the 2013 Criterion release. DeepDiscount. -- Amazon. -- Target. -- Barnes & Noble. 1956 DVD: -- this is a 2002 un-restored release by Sony Wonder. Amazon. 1998 DVD: DeepDiscount. -- Amazon. 1998 Blu-ray: DeepDiscount. -- Amazon. -- Or, the 4K-mastered version, if you want "expanded color" and so forth. Amazon NOTE: this is not a true 4K disc. If your Godzilla tastes are broader you may want to examine this list by B. Gorman "1138" over at Amazon. Every Godzilla Film from 1954-2004. Of course it's lunk up reeaal good, so if you want to click and buy, you can. Certain of these can be found on CD. Some even on LP, perhaps, from used item vendors. I found only two available right now. The 0000 soundtrack is available as mp3s or a CD. The 0000 soundtrack is (for the US) an import CD. The Best Of Godzilla 1954-1975 Akira Ikufube music from the Godzilla films. Get mp3s at iTunes -- Amazon. This music was used in many of the Godzilla films throughout the series. In fact, even Godzilla's growl was created by Ikufube on a double bass instrument. There are 43 cuts available, composed between 1954 and 1975. There is a page at allmusic.com that allows you to cross-reference and listen to samples of these cuts. The CD is available from CDUniverse. Want it on vinyl? Discogs may help you find a copy. The 1998 CD contains songs that are not in the film. Check the list before you buy the CD or download the mp3s. 1998 CD: Amazon. -- from ever-changing ebay. 1998 mp3: Amazon. -- iTunes. Amazon Instant Watch -- 1954. -- 1956. -- 1998 SD. -- 1998 HD. from MoviePoster.com. -- from MoviePosterDB.com older films. -- MoviePosterDB.com 1998 film. from AllPosters.com. Well, now, if you're inclined to watch such films as the three Godzilla films that I'm about to compare, you have some idea where to find a copy. As always, you know that you can use the various other sources that I don't use and don't post about. Officially, the Multimatch gets underway tomorrow, but that means I'll be working behind the scenes for a bit. I'm already writing essays. Collecting links for the Weblinks tech post. And I'm already dreading the long ordeal of setting up Quotes, Weblinks and Production Crew. Usually I give you a week in advance to read the Find-it post...but that wasn't possible this time. I've gotten the three reviews written, but they need graphics. All the frames have been grabbed from the three movies. It's only a matter of finding the time to decide what I want to show and what kind of graphic gadgets I'd like to use for the essays and reviews. I've also got some of the Millennium (recent) and Heisei (middle) series of sequels at the top of my Flix queue. Trying to see the original in the context of what it spawned. I watched Godzilla Raids Again recently. And I have my disc of Godzilla 2000 at the ready, too. I almost always read this thread. It's just usually either so comprehensive or I don't have much of interest to say. But I look at this thread whenever I see new posts in it. The transliteration "Godzilla" came from Toho studios, not from the American releasing companies. There are two ways of changing the sounds from Japanese to English. One renders "Go-ji-ra" and the other "God-zil-la." Both are correct. But Gojira has become the de facto title of the 1954 film. It is a good thing that someone loved this film enough to get it put back together the way it was so that we could see it in its original form. That's a good thing because the cleverly-done Terry Morse re-edit from 1956 had become the original Godzilla movie, and was the only cut available for over 40 years. But in Honda's original form it is so much more than any other Godzilla film ever made. Gojira is a very good film, as film. There are annoying lapses in the care taken with some of the miniatures, but aside from that I can't find anything to complain about. In other words, the American re-edit is "just a Godzilla movie" but Gojira is a film. I didn't understand the bizarre formation of the creature's face until I read that the concept was that the monster's head would resemble a mushroom cloud. It's a weird idea, and it isn't pulled off completely, but at least now I can see it. I left my note below, anyway. To understand the film you have to also understand that the producers were doing something that had never been done before. The giant creatures, whether reptilian or mammalian, that had appeared on the silver screen before 1954 had often been created with stop-motion animation. The brontosaurus in The Lost World, King Kong in his movie, and the other screen apes that followed him, the beast in Beast from 20000 Fathoms. But sometimes a man would put on a suit formed to look like a gorilla, and that was seen by special effects wizard Eiji Tsubaraya as an alternative to animating a puppet by hand. Given the time frame that the production faced, using a man in a suit was the only practical alternative. But the producers faced a huge problem: no one had ever done that before for a giant creature. They had to invent how to create a giant, apparently massive monster, moving about among tiny humans and their buildings. What they did was amazing for the time and their budget. Notice that I've written all this and never addressed the story, the plot, the acting, the editing. That's because the problems with the suit and the necessary miniatures were overwhelming to the creators of the 1954 film. The rest (story, cast, inventive and adept crew), they had well in hand. Like: Given the differences in acting style, the creation of most of the characterizations in this film are right on the money. I can't say that I understand precisely how the Japanese language is used in order to convey urgency or romance, so some of this comes across strangely in all Japanese language films. The characters always seem terribly understated or over-stated, but that's because I have English-based, American sensibilities. These people come across as pretty real people in a weird circumstance. Don't Like: When they ran out of time or money, the miniatures are embarrassing at best. Ex. : That helicopter that turns over in the storm. Ever since I first saw the movie as Godzilla, King of the Monsters, I've hated that shot. There's another with a crashing fire engine or two that I really dislike. The reason I dislike them in the Gojira version is because everything else is fairly well done. Oh, except that hand puppet. Like: Ed Godziszewski, author of The Illustrated Encyclopedia of Godzilla, created two short features for the Classic Media release of the 1954 and 1956 films. In the one about the development of the story he talks about the love triangle between Emiko, Ogata, and Serizawa. And he reveals that it was not in the original story by Shigeru Kayama. I'm glad it found its way in there somehow, because it's one of the most interesting human-scale features of the story. Like: This film is majorly more mature in its approach than the 1953 American production The Beast from 20000 Fathoms, and the two are basically the same story. But that adaptation of a Ray Bradbury short story is much more mature than a lot of other monster films that came after 1954. I guess I'm saying that Ishiro Honda's film is maybe the best giant monster film ever made, although it may also be among the most flawed. Its approach is literary, omitting any visual depiction of Godzilla's origin. As Steve Ryfle points out in the Classic Media commentary track, "We never know if Godzilla is a legendary beast, or a nuclear mutant, or both." In other words, Honda is content to let the kiddies in the audience wonder about that, rather than having to show everything in his movie. Like: Maybe it's because the line is delivered by Takashi Shimura, but whereas I'd normally be peeved at the political meddling, I don't mind at all when Doctor Yamane concludes the film by musing that we might face many other Godzillas if nuclear weapons testing continues. Actually, the line is--Kyohei Yamane-hakase: I can't believe that Godzilla was the only surviving member of its species... But if we continue conducting nuclear tests... it's possible that another Godzilla might appear somewhere in the world again. Like: Doctor Serizawa is convincingly conflicted by his discovery. I also like that he made that oxygen-destroyer discovery by accident while trying to understand a property of oxygen. So many scientific advances are made while actually attempting to study something else. That's why scientists have to be so very observant. But he understands how politicians would abuse his discovery. And the resolution of the story stems from both the love-triangle and Serizawa's basic moral nature. Godzilla simply gets caught in the middle of all this. Like: Without being able to show everything expansively, the film is presented in an expansive way that surpasses its true cinematic scope. It doesn't flinch from the ugly side of life and the choices that humans make. Politicians are shown to be grand-standers. Scientists are shown to have more on their minds than shipping company executives do. The story questions where true morality lies, and whether giving a promise should sometimes be reconsidered in the light of subsequent events. The screenplay is multi-faceted, subtle, occasionally light-hearted without losing its sense of weight, and without resorting to comedy to ease tension. The light-heartedness is often embodied in the way the romantic pair Emiko and Ogata approach each other. Also, this film either invented or continued the trope of having the tone of the film take on the attitude of the youngsters when an older person, who is always right about things, is telling his or her perceptions of what's going on. Like the elder on Odo Island in the early part of the film. Don't Like: The reporter character, Hagiwara, seems to be intended to drive the story forward in some way, but he doesn't do this. He's just...there. Perhaps he was intended to be expository in nature, but some other character is always where he is, paving the way. He does nothing on his own. He is only slightly less a wall-fly than the Steve Martin character in the American re-edit. Like: The ways in which Eiji Tsuburaya devised to show what this fantastic story wanted to show are amazing at every turn. Clever, annoying, beautiful, amateurish. They are all these things. But the impressive point is that he managed to get it all done, and to get it done pretty much on time (although not on budget). Some of them don't come off as well as others. But to use a hand-puppet for some of the monster shots is a brilliant approach. If only they had had about three times as much money for building the puppet. Don't Like: To my Western eyes the Godzilla face doesn't look frightening so much as...comic. I understand that as my fault, though. Don't Like: I ran out of things for this Don't Like list before I ran out of pre-planned spaces. Am I praising this movie too much? I don't think so. It's an excellent tale. Eiji Tsubaraya is quoted in the feature about development of the story: "Our film was a big experiment, so to cover up all its shortcomings we needed to have a better story." They got a better story, and the magical thing is that it works. Whenever I feel embarrassed or peeved at a failed special effect, the story and characterizations quickly pull me back into the film so that I don't remain focused on any shortcoming for any length of time. I wish more modern filmmakers understood this principle. The 1956 re-edit "remake" changes the story, makes it more childish, and in some negative ways set the tone for all the Godzillas to come after it. Had the 1954 film set the tone for later kaiju films, I wouldn't have been able to say to myself before going to see the Emmerich version in 1998, "It's a Godzilla movie. There's no need to have any high expectations of it." On the other hand, the 1954 film is so intellectually and emotionally stimulating that viewers would have gotten worn out if all Godzilla films had stayed at that level. At least after 2004 we have Honda's original effort to watch as he intended it to be seen. And contemplated. The most recent 6 films had him looking just like a giant lizard, yep. "We scientists created Godzilla, and ever since we've been trying to destroy him." Godzilla looks like this in that film. I found a scan from a magazine, it looks like, that shows Godzilla faces up through 1994. I have an essay about that underway. Shigeru Kayama wrote the story treatment for this film. The screenplay was adapted by Ishiro Honda and Takeo Murata. According to Ed Godziszewski's documentary feature about the story (on the Classic Media DVD set) Kayama had already written stories about mutant sea monsters, so producer Tomoyuki Tanaka asked him to do the treatment. Tanaka was the producer of many of Akira Kurosawa's films, in case you're interested. Kayama's story had most of the same plot points of the screenplay, except he had the monster appear in the human world because it was hungry. Dr. Yamani was a very peculiar, even bizarre figure in the Kayama treatment. And there was no love triangle in Kayama's version. When Murata and Honda began to develop the screenplay they made changes to those parts. Godziszewski says that Kayama took three weeks to write the treatment, then Honda and Murata spent another three weeks deriving the screenplay from it. There were two later revisions, he says, the second of which was converted to the first series of storyboards ever used in Japan. Honda went on to become a director famous for this kind of sci-fi/fantasy daikaiju movies. (I'm told that daikaiju translates: dai=giant, kaiju=monster, so "giant monster") Kayama wrote four of them between 1954 and 1957. He has a screen credit for the Americanization that came out in 1956. Honda's 12 writing credits include films besides daikaiju flicks. But his 59 director credits contain a large number of such films, including the 1975 Terror of Mechagodzilla. The IMDb filmography page reveals that Honda directed two of the segments of Akira Kurosawa's Dreams (1990). Honda died in 1993, 81 years old. Takeo Murata has 13 writing credits, many of which pair up with Honda's. Murata both wrote and directed a feature film in 1941, with another writing credit that year. His last writing credit was in 1959. Alongside all the writers credited in the Japanese version, Al C. Ward is credited with writing the US sequences in the 1956 re-edited version of the Honda film. His entire writing career is bulgy with television scripts. He also produced several episodes of 5 television series, and directed a few episodes as well. At the end of his career (1969 to 1976), Ward created a television series, Medical Center, that ran for 7 seasons, made Chad Everett a big TV star, and earned Ward one of his 43 IMDb writer credits. But that series alone gives him 166 episode credits as Creator of the series. The same program garnered two wins and several nominations for awards. Dean Devlin and Roland Emmerich have worked together since Devlin was one of the stars of the movie Moon 44 (1990). Devlin's first screen writing credit is for Universal Soldier (1992). He wrote four Emmerich scripts in a row. In 1994 Devlin became a producer as well as the screen writer for Stargate. Since 1999 he has been more focused on his producer hat, and has not worked with Emmerich. Roland Emmerich has varied credits, just as Devlin does. On most of the films where they worked together, both have screenwriter credits. but it's from a website that makes cufflinks from typewriter keys. Who wears cuff links? If you look at my av you'll see that I was wearing cufflinks during that period because all my shirts came with French cuffs, no buttons. Had to use cufflinks. After a few years of that I was weary of cufflinks enough to last a lifetime! Heh. I hope lens flare isn't what you call "cleaning up." Not much improvement, there. I've only worn cuff links that came with tux rentals. Don't ever recall wearing a dress shirt with French cuffs either. It's been a sheltered life. I have 3 shirts which require the use of cufflinks. As a groomsman in a wedding once, I was given custom cufflinks that I still use. Those typewriter links seem pretty nifty though. Also, when I scrolled down... I thought "Wait... did he put a lens flare on there, Haha. He's channeling his inner J.J."
Cuff links. The most popular topic in this thread so far! Something tells me that the human body and mind did not evolve in a way conducive to viewing a number of Godzilla films day in and day out for an extended period of time. Still trying to see as many of them as I can to guide me in writing about the legacy of the 1954 film. There is a definite uptick in the quality of special effects in the Millennium series made in 1999 to 2004, but the stories are not always of good quality. I still have a lot of my sets of cufflinks from the 1970s. My dad had a set that was gold ovals with dark blue glass oval insets that I found fascinating when I was a boy. Back then businessmen generally wore shirts with slots for cufflinks, but not French cuffs (until the late 60s and the 70s when they were de rigueur for everyone). I knew there were a lot of Godzilla films... but definitely didn't know there were as many as there are. Just looked it up. I wouldn't have thought there were more than James Bond for some reason... it must just be exposure, I suppose. I just realized I lied here. I know I've seen at least Godzilla vs. Mechagodzilla in addition to that, and probably a few others. In my defense, I only have vague memories of these. Everyone is more Godzilla-savvy than they think they are. Ha ha! Because Ishiro Honda's 1954 science fiction film was not only critical of the atomic bomb, but more or less called it a monster on the loose, things had to be changed for American audiences to want to see the film. Allegedly, US audiences of the day would not want to see a film with an all Japanese cast, so an American had to be added. Adding an American meant changing the story line. Terry Morse was very clever in the way he went about doing this. If you have never seen Honda's original version you have no idea how things are moved around, glossed over, eliminated, and re-directed. One of the joys of owning the two releases from Classic Media and Criterion is that both 1956 films have knowledgeable commentary tracks that carefully reveal the sleight of hand Terry used, and exactly what he did to make Honda's 1954 giant monster film into just "a Godzilla movie." The result is not nearly as good a film as the original, but the work that Morse accomplished to bring off his American version is astonishing. And I have to say that he took great care with what he did, even though it lessened the ideas from the original film. Above all, it works as a movie. Although it's sad to see how diminished the themes are, if not removed altogether. Morse didn't screw around with the love triangle, or the seemingly unreasonable attacks that Godzilla makes on Tokyo. The tragedy of the situations is not reduced. But somehow the final version comes off more as entertainment than message. Less literary and more pop-corny. 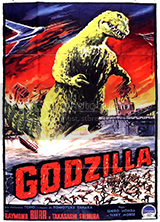 In 1957 the English language lines were dubbed over with Japanese, the top and bottom of the frame were cut off to make it "widescreen", and Toho released Morse's film to Japan as Godzilla, King of the Monsters. IMDb reports on the trivia page for King of the Monsters: "The Japanese version of the film received a Japanese Academy Award nomination for Best Picture but lost to Seven Samurai. It did, however, win the award for Best Special Effects. It is the only Godzilla movie to receive a nomination for Best Picture." Thank goodness for Kurosawa, eh? So, The re-edit of Honda's film became the prototype for later Godzilla movies. Fluff with a few high-sounding lines tossed in (for gravitas that doesn't really ever show up). Like: I suppose I should change this to Admire: the craft shown by Terry Morse in carefully reorganizing the Japanese film and retaining at least some coherence in the revised story line. Not that I particularly admire the result. It's fun to watch, but not very thought-provoking. However, keep in mind that between the 1960s when I undoubtedly first saw this film and 2007 when I was able to buy the 2004 issue of the 1954 film for the first time, I had no idea of any of this. I had only known of the existence of the 1954 version since the year 2000. I had never seen it, so could not judge the difference for myself until 2007. And what a difference. Like: The flashback format doesn't really hurt things. Given that the seriousness is robbed from the original story by Al C. Ward's cut and pasted Raymond Burr sequences, it's a fairly literary structure to use. But it gives away everything from the beginning, voiding any mystery. Like: Some of the original Japanese lines are not translated for us, subtitled, or explained by the Steve Martin or Security Officer (Frank Iwanaga) characters. Like: Frank Iwanaga, the actor playing the Security Officer uses his standard American accent, rather than imitating a Japanese accent. I've met several native-born Japanese immigrants who speak English as if they had grown up in the Midwest. But this actor's apparent first name is Tomo. Not Frank. What's going on here? IMDb says he was born in Fresno and named Yasuo Iwanaga. I'm confused. But I like that he didn't affect a phony Japanese accent. Like: Terry Morse left Akira Ikufube's music alone, using it instead of bland American-style stock music cuts. To that extent, he preserved the very style of Honda's film in his movie, which is worth noting. Don't Like: Terry Morse's re-working of the Honda film robs it of all the seriousness that the original had. Where the essence of that seriousness remains, it is belittled, as if anything not pure fun doesn't belong on the screen. Whereas Honda managed to subvert the basic silliness of the idea of Godzilla itself, Morse plays off that basic silliness and uses it to make us be simply entertained by the images. It's as if he uncorked the film, and poured out everything that wasn't "flick" about it, poured back in a dash of "movie," and shook it all up to make something carefully calculated to not be approachable as "film," but as a mere flick. We are left with spectacle. And little more. Don't Like: This has nothing to do with the movie, but it was so successful that it was dubbed into all kinds of languages, and even sent back to Japan, where it became a big hit. This means that King of the Monsters had more influence on the tone of the subsequent Godzilla vehicles than the original Honda film had. Don't Like: There is a lot of narration by the Steve Martin character to be sure we understand everything that's going on...in a particular way. It's spoon-feeding, I guess you'd call it. The 1954 film induces thoughtfulness in the viewer. This one encourages you not to think. At all. Just watch. I do agree with David Kalat that the narration by Martin during the second Godzilla raid on Tokyo adds tension that isn't there to the same extent in the non-narrated original version. As for the rest of the narration, it's often just extraneous. 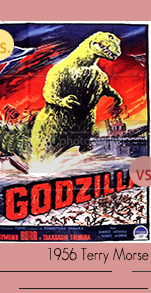 Don't Like: Politically understandable to make the movie appeal to Americans of the 1950s, the removal of Doctor Yamane's last line ("I can't believe that Godzilla was the only surviving member of its species... But if we continue conducting nuclear tests... it's possible that another Godzilla might appear somewhere in the world again.") is still insufferably dim-witted. Yeah, this re-edited movie is not meant to be a critique of anything. Grab the popcorn, turn off your brain and let your eyes glaze over amid the black and white spectacle. I barely escaped the atomic bomb in Nagasaki -- and now this! They seemed certain about the accuracy of their report. How could we create such a thing? It seems like even now Honda's original premise is being edited out of presentations of his work. David Kalat's excellent commentary on the Criterion release takes issue with some of my more negative perceptions here. And he makes excellent arguments that how you view the miniatures and special effects in any film are perceptual, not factual. Scenes that wow original audiences can elicit giggles from audiences a few decades later. But what is on the screen is the same, Kalat notes. I can buy that. He also points out that the subtext of both versions of Honda's film is the same, it is only the text that has been excised. So if he is correct, I am wrong for excoriating Morse for removing the lines that I mentioned above. But they don't take that much time, and even if you're saving time, you can't justify removing the voice of the original speaker because you don't think anyone wants to listen. Can you? We can't overlook the fact that for decades this was the only version of Godzilla in release outside Japan. I learned this from the Classic Media commentary track by Ed Godziszewski and Steve Ryfle. Apparently, in the 20th century the original Honda film was never dubbed and shown overseas in its original form. So, until 2004 this 1956 re-tread was Godzilla to the world. As sad as that is, I can understand that the 1954 film would probably never have spawned as many sequels. It did, however, spawn Godzilla Raids Again (a bit more in the spirit of this movie than the first one is) in 1955. So, Toho clearly already had plans. They were complicit in the Terry Morse re-working that was released in America in 1956. And they imported that film back into Japan, releasing it in "wide-screen" in 1957. Kalat says that only the English parts were dubbed into Japanese, so the sections that Morse had edited without regard to actual Japanese dialog must have seemed like what he calls "nonversations" to the Japanese audiences of 1957. With the success of the big gray monster over the years, it's obvious that Toho knew what they were doing. But I have read that the American versions of most of the sequels were also edited, scenes were shoved around, music was changed, translated lines were re-written in translation. I have no idea what the original Japanese versions of the 1954-1975 Showa series Godzilla movies might have been like. The Millenium series titles I've seen are made much better than those 1960-1975 films from the Showa series that I've seen, but I've seen the edited American versions. Still, Big G and Anguirus talk in one of them. How could that have been any better in Japanese? Although I can't be sure what it really means, at Rotten Tomatoes the user votes for the two films are of interest. Gojira has 8,147 user ratings at 87%, and Godzilla, King of the Monsters has 8,726 user ratings at 73%. That's about the same number of votes. Perhaps some of them have seen both the film and the movie. Feels like I'm moving awfully slowly on this Multimatch. Of course this is the first one I've decided to watch 863 films for, but then it's the first one with 862 sequels. Kazuji Taira edited this film but is credited as Yasunobu Taira (birth name). I cannot find out whether this is a man or a woman. The biography at TCM looks like this. The one at IMDb like this. It's kind of frustrating, so I'm going to go with this baby name site and use "he" for the editor. Between 1954 and 1961 Taira garnered 11 editor credits. For Gojira he used his birth name. For his last, Mothra, he used a different pseudonym. I don't know anything else about this person. I have seen four of the films he edited, though. Five of Taira's works were directed by Ishiro Honda. Taira was the editor for the first two Godzilla films, both Gojira and the 1955 release Godzilla Raids Again, directed by Motoyoshi Oda. He worked in other genres beside giant monsters and sci-fi. Terry O. Morse has more editorial credits (65) than all his others combined. He was the film editor for Blue Hawaii (1961), The List of Adrian Messenger (1963), and Robinson Crusoe on Mars (1964), all of which sort of became cult films of one type or another. He began editing movies in 1927, and continued to do so through 1973. Morse died in 1984 when he was 78 years old. As I wrote in the Director post, Morse was a "film doctor," and it was his experience as an editor that allowed him to quickly and efficiently shoot stand-ins from the back who could seem to interact with Steve Martin while "being" the principles form the Honda film. So far I've not found out why this film has two credited editors. Peter Amundson and David Siegel both became movie editors at about the same time. Amundson started in 1990 on a TV series, but by 1996 was primarily working in feature films. Siegel has worked since 1991, mostly on TV shows and made-for-TV movies. Amundson was the editor for 9 films I'll admit I saw, and one that I won't. He has 22 credits altogether, including Pacific Rim, which is not one of the films I just mentioned. David Siegel has worked on several high-profile television series, editing a number of episodes each. He also has worked with producer Dean Devlin on both Godzilla and Eight-Legged Freaks. While I haven't seen it (or at least, I don't think so), I know that Godzilla 1985 was substantially re-edited for its American release so that it would come off as a "so bad it's good" affair. Wikipedia has a rundown of the changes - there were a lot. When Godzilla 1985 failed at the box office, it was the last Godzilla film produced by Toho to receive any major release in North American theaters until Godzilla 2000 fifteen years later. That 1999 film was the first G film I saw in the theater. Oh, well, that's if I don't count the Tri-Star film. Masao Tamai was in his 22d year as a cinematographer when the lot of photographing this experimental monster movie fell to him. The use of over-cranked cameras meant much brighter lighting in the studio. If the cameras run at 10X normal speed, that's 240 frames per second, so the relative exposure is reduced to 1/10 the shutter speed (at least) that you could use for normal studio sets. If you notice, the man in a suit technique is used mostly for night shots. Even though the hand puppet is used for some nighttime shots, any daytime revelations of the beast use the hand puppet. For this reason we have to understand that Tamai might have done a much more consistent job on his other projects. Timing shots up and down and so forth requires expenditure of hours and money, and by the time this film was in post-production they were way over budget. I assume that the Mainichi Film Concours award that he won in 1952 for his work on Meshi (1951) demonstrates that sometimes technical difficulties can tarnish the work of even the best men and women. Still, according to IMDb, Tamai is know above all else for his work on Gojira and its 1956 re-edit. He worked on at least four films directed by Mikio Naruse, including a couple of titles I've seen flicker up once in a while on this board. Among them, When a Woman Ascends the Stairs (1960). For many years the end credits of the Jewell Enterprises release were thought to be lost, but they are included on the set released in 2004 by Classic Media, and in a cleaned-up version on the 2012 release from The Criterion Collection. At the end of the Morse movie Masao Tamai receives a screen credit for being one of the two "cameramen." The other is Guy Roe, who lit and shot the American inserts. From 1946 until 1951 Roe worked on theatrical films. After 1952 he joined those brave souls who tossed their fortunes in with the new television industry. He was always an ASC member, working mostly on westerns through the 1950s. Roe died young on December 12 in 1959. Among his credits are five episodes of one of my favorite western TV series of all time: The Rifleman. Ueli Steiger started accumulating cinematography credits in Germany in 1984. He shot 14 films before he took on Godzilla for Roland Emmerich. He would work with Emmerich again on The Day After Tomorrow in 2004 and 10,000 BC in 2008. I've heard of and seen some of the other films Steiger shot, and they aren't among my favorites. One of them is Bowfinger, which is among the worst flicks I've ever, ever seen (although I generally expect at least one or two of y'all loved it to death). However, as I always say, the cinematographer is usually not the one responsible for a film being bad. I looked up this Ueli Steiger fellow to see what else he'd done, and it turns out he shot The Jerky Boys: The Movie. I didn't know the Jerky Boys were an actual thing, I always assumed it was just a joke from Arrested Development (the only records George Michael owns are by the Jerky Boys). You learn something every day. I didn't say it earlier, but I'm really enjoying this thread. I feel like I'm learning a lot, and the amount of research and work you seem to be putting into it really show. But you are wrong about Bowfinger. It's hilarious and has two of Eddie Murphy's best performances. Well, when I saw it, that isn't what I thought about it. Sold my DVD to a gameshop that resells old game discs and DVDs. I'm glad you liked it. I figured someone would! One of them is Bowfinger, which is among the worst flicks I've ever, ever seen (although I generally expect at least one or two of y'all loved it to death). I bought it because Frank Oz directed it. Interestingly, that movie has Steve Martin in it, and this Rematch includes a movie with a character named Steve Martin. Hmmm. I appreciate the kind thoughts about the thread, BTW. Eiji Tsubaraya directed special effects on Gojira. Although he has special effects credits on 93 titles, he was involved in 9 different areas of film production that led to screen credits. His first outing in special effects was in 1937. Naturally, during the Second World War he worked on propaganda films featuring war scenes. He learned how to use miniatures, which made him the obvious person to be in charge of special effects on Honda's film. Akira Watanabe was the art director for Gojira. He is known for 45 films, mostly Toho monster-fests for which he was in charge of Art Direction. Award winner Akira Ifukube wrote the score for Gojira, and 270 other films during a career that spanned from 1947 until 1995. He was also a classical composer. It's likely that his best-known music is the score that he wrote for Gojira in 1954. Those melodies get stuck in my head, even though they are not simple, like most sticky music, but are rather more complex musically than much of what we hear in films. He died in 2006, but continues to garner screen credits as his Gojira themes are quoted by the composers who create the music for more modern Godzilla films. Patrick Tatopoulos was responsible for the design of the 1998 Godzilla character. He has screen credits in 11 different areas of film-making. Whether you like the design he came up with for Emmerich's Godzilla or not, he has been involved in the visual aspect of films since 1991, sometimes as production designer, sometimes doing make-up. Volker Engel...visual effects supervisor and Karen E. Goulekas...associate visual effects supervisor (as Karen Goulekas) do a commentary track for the 1998 movie that is informative, and possibly more interesting than the film, depending on how you feel about the film. Well, I've now seen 25 of the 30 Godzilla movies that have been released since 1954. Augh. What a marathon. It took most of a month to get and view the ones I hadn't seen that are easily available. That's enough. 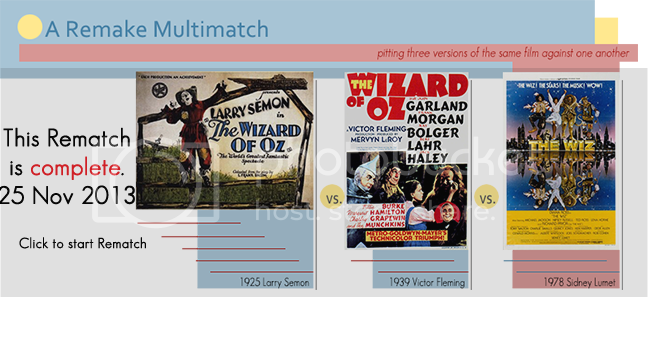 Even though some of the essays planned for this Multimatch require comparisons to later Big G flicks, I have seen all I want to. Perhaps forever. A Couple of Remakes--but the Sequels! It all started with one movie. And that one spawned a very large number of sequels. The new Legendary Pictures Godzilla reboot was originally supposed to be released in 2012. That would have enabled me to include it in this Multimatch. Then it got delayed. Will it really debut to the world in 2014? We'll see. Whenever the film premieres, it will be the 31st film featuring a giant creature that was dissolved into nothingness at the end of its first screen appearance. No other film in the prior 18 Remake Rematches spawned so many sequels! Planet of the Apes is the only one that would come close, but is way behind in numbers. It seems impossible to properly consider Gojira and Godzilla, King of the Monsters without acknowledging what came after them. The first sequel came out the year after Gojira. It was called Godzilla Raids Again (1955) ([Gigantis, the Fire Monster, (1959) in America]). (The Return of Godzilla wouldn't come along until 1984). Don't forget that King of the Monsters, which came out in the US in 1956, was released in Japan in 1957, dubbed into Japanese! It may or may not be instructive to list the films in the order they were made (with help from a Wikipedia article). I will place an asterisk next to the title of any of these films that I have seen. To date I've seen 25 of the 30 that exist right now. 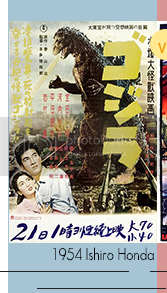 The Showa series (1954–1975) so named because the films came out during the reign of the Showa Emperor, Hirohito: *Gojira (Godzilla) (1954) -- *Godzilla Raids Again (Gigantis, the Fire Monster) (1955) -- [the Terry Morse re-formulation fits in here, in 1956] -- *King Kong vs. Godzilla (1962) -- *Mothra vs. Godzilla (*Godzilla vs. The Thing) (1964) -- *Ghidorah, the Three-Headed Monster (1964) -- Invasion of Astro-Monster (Monster Zero, *Godzilla vs. Monster Zero) (1965) -- Godzilla vs. the Sea Monster (Ebirah, Horror of the Deep) (1966) -- *Son of Godzilla (1967) -- *Destroy All Monsters (1968) -- *All Monsters Attack (Godzilla's Revenge) (1969) -- Godzilla vs. Hedorah (Godzilla vs. the Smog Monster) (1970) -- Godzilla vs. Gigan (*Godzilla on Monster Island) (1972) -- *Godzilla vs. Megalon (1973) -- *Godzilla vs. Mechagodzilla (1974) -- Terror of Mechagodzilla (The Terror of Godzilla) (1975). These got progressively sillier, and are more and more disappointing to me the farther into the series you go. I saw none of these in the theater, most in the 1990s from VHS tapes. And, oddly, some in Japanese with English subtitles! I think my son's favorite monster was Kumonga, the giant spider, under the name Spiega. In the English dubbed version of Godzilla vs Gigan, the monsters are dubbed speaking, while the Japanese version has word bubbles. Ugh, to both. There are 15 Toho films in this period, plus one American re-edit. I've seen 12 of 16. The Heisei series (1984–1995) is named after the reign of the Heisei Emperor, Akihito: The Return of Godzilla (*Godzilla 1985) (1984). This film ignores anything that happened between the 1954 film and its own timeline, so is a reboot, in modern parlance. Godzilla 1985 is a re-edit, similar to the 1956 film, again adding scenes with Raymond Burr as reporter Steve Martin -- Godzilla vs. Biollante (1989) -- *Godzilla vs. King Ghidorah (1991) -- Godzilla vs. Mothra (*Godzilla and Mothra: The Battle for Earth) (1992) -- *Godzilla vs. Mechagodzilla II (1993) -- *Godzilla vs. SpaceGodzilla (1994) -- *Godzilla vs. Destoroyah (1995). My initial viewings were on HBO for Godzilla 1985, and VHS for the King Ghidorah film. The last two in the series were on a single DVD. My experience with the first two series is that the longer they go on the worse the films get. There are 7 Toho films in this period, with one American re-edit. Recently in my Godzilla marathon powered by Netflix, I've seen three more of these, making 6 of 7. 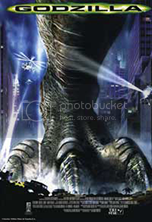 The Tri-star/Centropolis film comes in here: *Godzilla (1998). It was the first film with the name Godzilla in the title that I ever saw in a theater. This was supposed to launch at least three American Godzilla films, and Toho was planning to wait until 2004 to make its next Godzilla. But critical reaction caused them to change their plans, while box-office for the 1998 movie caused them to start a series of six more Toho Godzilla flicks the next year. The Millennium series (1999–2004) is named because it came out at the turn of the millennium: Once again, the sequels are based on the 1954 original film, but each follows that film, not any others in the series; thus, many of these visually quote the 1954 film, but the Big G's shots are mostly replaced by the millennium Godzilla suit. Also, Godzilla's appearance can change from film to film. Some of them also reference individual films from the Showa and Heisei series. Godzilla 2000: Millennium (*Godzilla 2000) (1999) -- *Godzilla vs. Megaguirus (Godzilla x Megaguirus) (2000) -- *Godzilla, Mothra and King Ghidorah: Giant Monsters All-Out Attack (GMK) (2001) -- *Godzilla Against Mechagodzilla (Godzilla x Mechagodzilla) (2002) -- *Godzilla: Tokyo S.O.S. (Godzilla x Mothra x Mechagodzilla: Tokyo S.O.S.) (2003) -- *Godzilla: Final Wars (2004). Although I have seen Godzilla 2000 both in the theater and on DVD, I've seen it only with a dubbed English soundtrack. I was able to watch the rest of these in the Japanese version with English subtitles. There are 6 Toho films in this period with no American re-edits. I have seen 6 of 6, but I must confess that I remember virtually nothing of Final Wars! Very few of these films were released to the theater in America. I'm trying to learn how many were shown in the theater in Japan. Between King Kong vs Godzilla and Godzilla 1985 few got theatrical releases, but everything was shown on TV. Then there was another long gap between the 1985 theatrical release and Godzilla 2000, when only VHS and DVD carried Godzilla into American eyes. Now, if the 2014 film isn't like the Toho films, there will probably be a great hue and cry of betrayal from the international fan-mob. I won't care, as long as Godzilla smashes a few buildings during its run time. These aren't expected to be 4-star movies. Godzilla Franchise. A Wikipedia article. Showa Era. From Wikizilla, the Godzilla Wiki. Godzilla Movies Best to Worst - a list by linus_andersen95 at IMDb. There is a 1962 release called Reptilicus, directed by Sidney Pink, that is almost completely cinematic crap. Wait, I'm being polite: it is definitely cinematic crap. It is also one of my favorite films, and has been since I saw it in 1962. As I wrote elsewhere in this Rematch, I've liked scenes of giants trashing cities since I was a wee lad. Real life destruction is not a thing I like, nor do I pretend it's okay. But on the screen to pretend is okay! Nine years before Reptilicus there was a film called The Beast from 20000 Fathoms, based on a Ray Bradbury story. When it appeared on NBC Saturday Night at the Movies I fell in love with it. Eiji Tsubaraya had seen that film when he concocted the notions that led to Gojira finding its way to the silver screen. Them!, a movie about giant mutant ants running amok in the California desert captured my attention, caused me goosebumps, and became one of the movies that made me love movies. I saw a boring comedy film entitled The 30-foot Bride of Candy Rock with my 'rents at a drive-in theater, and fell in love with the idea of mutant human giants. Later, Attack of the 50-foot Woman scared the piss out of me one night when my parents were at a Pinochle party and all us kids were watching "Chiller" between 10:30 p.m. and midnight on Saturday. Actually, the only scary part was the attack of the giant alien that turned the blond-haired white woman into a 50-foot giant. Chiller also brought us War of the Colossal Beast and other such films that scared me, much to my delight. My mother hated my nightmares, but she couldn't dissuade me from filling my impressionable noggin with such "junk." My dad took little bro and me to see Gorgo (at my insistence) when it came out in 1961. That might be why I was primed for Reptilicus, and why I loved that second film despite my disappointment in the monster effects (marionette). Truth be told, I loved Gorgo, I merely liked Reptilicus...or the idea of it that I formed at age 10. I actually saw Gorgo and Reptilicus at the Center theater in downtown Little Rock. I saw all these movies before I ever heard of Godzilla. As I wrote elsewhere, I first saw the last half of Godzilla, King of the Monsters some time during the 1960s at my parents home in Little Rock. I wasn't sure about the guy in the rubber suit. But I liked the oxygen destroyer special effect. I even thought the look of the water bubbling up beside the boat at the end was part of the special effects, rather than a give-away that the ship was a miniature. I thought that "giant water" effect was very cool. I wondered how they did it. I didn't fully understand miniatures in those days, although I had built model houses, cars and airplanes and had them sitting all around my bedroom. 30 Foot Bride Stills With Lou Costello & Dorothy Provine. Posted Sunday, August 26, 2012. Them! Them!! Them!!! or: How I Learned to Stop Worrying and Love Giant Mutant Killer Ants. Posted Wednesday, July 27, 2011 by Kevyn Knox. Catching Some Rays. Featuring Beast from 20000 Fathoms. Posted in Jim Lane's Cinedrome, Tuesday, August 20, 2011. Gorgo (1961). From 25 Movies that Hate London. At Total Film.com. Posted May 2013. Attack of the 50 Foot Woman (1958). July 20, 2011 via allyouneedismovies. REPTILICUS (1961) a monstrous slice of Danish. Posted by Mark Hodgson at 9:25 pm March 07, 2007 at Black Hole Reviews, blogspot. It seems that the criticisms of this film would not have been so shrill if the title had been something like Ebertosaurus, Son of the Creature that Lurks Below the Monster from Beneath the Salty Waters from Out of the Sea. 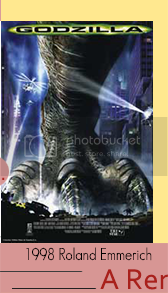 But Toho contracted with Tristar Pictures to make a film featuring Godzilla, and entitled Godzilla, so this is what we got. I have never heard anyone criticize any other Godzilla movie for not being scientifically accurate. Not a single one! But this one had all kinds of criticism rained down on it from the moment the theater doors opened. Including intensely tedious lists of every scientific error that is in the film. And maybe some that aren't, just in order to make the lists more complete. I went to see it with five words uppermost in mind: "This is a Godzilla flick." That phrase prepares me for all on-screen Godzilla sightings. In fact, in the entire history of Godzilla movies it has been unnecessary only for the 1954 film. The magic of that phrase is this: all pretense of realism and accuracy should be tossed out of the brain before engaging the film. Period. So I marveled that prissy fanboys were all twisted up because their precious monster didn't look like what they wanted, and didn't act exactly how they wanted. In other words, most of the criticism I read about the film (and it is terribly flawed, because it is a Godzilla flick) seemed childish. In all honesty, before I began this Rematch I had seen the 1998 Godzilla precisely twice: once in the movie theater the weekend it premiered, and once the day I bought the DVD. And that's really been enough. There are things I love about the film (many of which are those things hated by the fanboys) and there are numerous things that I don't like at all, but I suffer through them in order to see a big critter trash New York architecture. Let me be as clear as possible: the only reason I have ever watched any Godzilla movie was to 1) see buildings get smashed by a giant monster, and 2) to see a giant monster smashing buildings. All other normal filmic considerations are immaterial, okay. Got that? 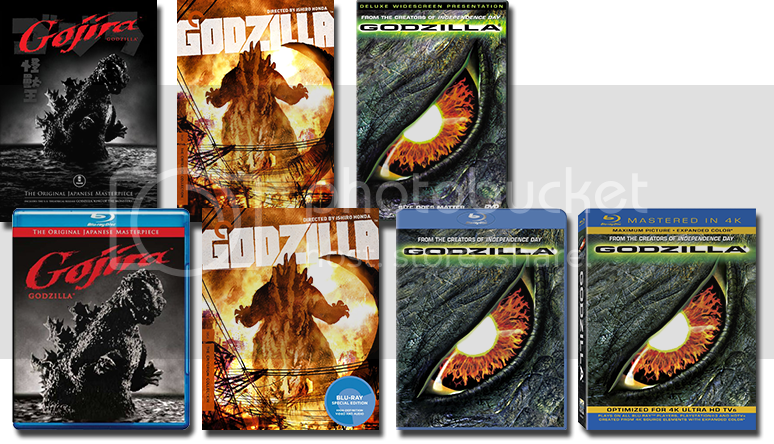 This is the truth of my Godzilla career up until I decided to watch Gojira and see what it was all about in 2007, when I bought the Classic Media 2-DVD set with the '54 film and '56 movie. Now, Gojira is actually a film, but the other 30 Godzilla outings are no more than flicks. Why criticize a flick? But I'm going to, below. Like: A giant monster does architectural damage and I get to watch it sort of happen. It doesn't really happen. Because in this film it's not even miniatures, I guess, only CGI sleight-of-hand, but it looks terribly cool. Terribly so. The CGI is not sub-par, the way the whiners said. But CGI is not an over-cranked man-in-suit attacking miniatures. It looks different. I love suited actors stomping on miniatures with a great passion, but I had read about the CGI in advance, so I didn't go expecting to see this. And I was not disappointed. Like: Not one single toy helicopter turns over slowly but way too fast in this film. Not a single one. Like: There is not an alien invasion or an attack by the British redcoats in this film. It being Emmerich and all I thought I was on the mark to fear that there might be. But there isn't either one! However, the French do turn up. Since I totally like the Frenchman who represents that nation in this film, it leaves me happy. Like: The character design of Godzilla is vastly different from what Toho uses in its movies, but I like what the Emmerich team put together. 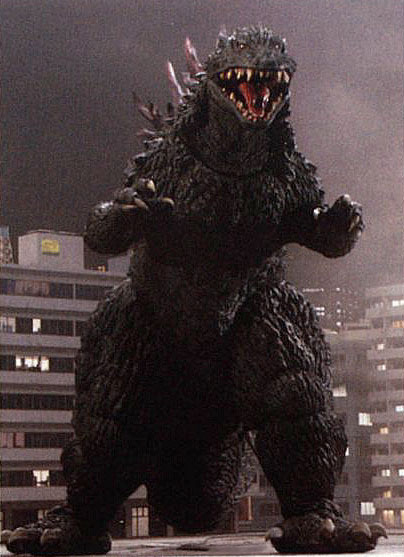 In fact, I've always thought Showa-Godzilla's face looks kind of -- goofy. All right, really goofy. Not like a monster, but like a kabuki mask. This may be intentional. Later, Toho made the face look a bit more reptilian and frightening in the Heisei and Millennium series. Have you ever noticed that the costume is hardly ever exactly the same? I'm sure if I saw the Showa series creature in real life and it was 50 meters tall, I would find it frightening. But on screen I find its face -- goofy. The '98 CGI zilla is not as goofy. Uhm, not in the same way. Oh, all right, it's goofy in that it looks a bit Leno-ish, but it's fiercer than the original Showa series Japanese face. Like: For the most part the special effects in this movie are really good. Emmerich makes crap films, but his special effects are always quite special. And Godzilla 2000 took some tips from this, which improved the film greatly. Like: There is only one monster. It does not fight another monster (yay!). It does have babies, though (Hmm). But that's a bit of a downer, in the way it's used. Like: The musical cues are actually pretty good. But for some reason (I've heard) the orchestra cues aren't on the CD. Like: When the production team get things right in this movie, they get them really right. Don't Like: They don't get things right often enough. Don't Like: Comic whining and bumbling! I think it's supposed to be comic, and it is, for a while. But then it's just grating. Although I do like that the characters face setbacks and rise above them. Don't Like: There is a typical Emmerich tendency to make everything way too biiiiiig. Wouldn't a dozen zilla eggs have been enough? And frightening enough? But everything in the film is pushed past scary to ridiculous. Were they afraid we'd be overwhelmed with fear, so they dialed it back by pressing forward with the yucks? Who knows? Misfires happen left, right, and overhead in this movie. And they are nearly as constant as the rain. Don't Like: Speaking of the weather, I always thought that a movie entirely set in drizzle would be cool. Apparently, so did Dean Devlin and Roland Emmerich. We were all so fracking wrong! You know how when it rains for hours or days on end it's nerve-wracking? But when it's real rain you can at least go inside and escape it. Not with this film. Just when you think it's over with they cut to another scene that has rain. Sigh. There is one place where they go that it isn't raining, though. One place, at least. But in that location it rains inane comic lines, and the most ineptly done CGI of the whole flick, so...yeah, there's no escape. Don't Like: Leaps of logic. Worms to giant lizards? Oh, it's the radioactivity exposure that...well, that still doesn't make sense. Not even scientifically. Reptiles and annelids are not the same...Augh! Don't Like: The eggs hatch. All of 'em. Nearly all at once, too. All but one. Never was a more blatant play for a sequel put into a film. But, see, there were already plans for two sequels to be done, because neither the producers nor the distributors foresaw the backlash that this film would generate. That killed the sequels. They should have left the eggs out. Don't Like: The Emmerich pacing and pushing in to closeup takes of actors just before something happens was already getting old by 1998. You can always tell what this director guy is going to do next, because he now telegraphs everything with his style. For example, the film 2012 didn't have any surprises because Emmerich couldn't stand to just spring anything on us. I think he started this technique in Godzilla, or maybe in Independence Day. Or, possibly in Moon 44. Push to actor/actress/crowd with astonished face(s). Cut to (the script always has the pretentious phrase "Smash cut to"--heh) something biiiiiiig. Don't Like but Don't Hate: You could level the same criticisms at nearly any of Emmerich's films, couldn't you? Maudlin, check. Hyper-fast cutting, check. Whining characters, check. Too heavy on the SFX, check. Inept and total lack of understanding of military ranks, check. Obsessed with biiiigness to an embarrassing extent, check. Repeating set pieces and characters ad nauseum from film to film, check. You'll rarely be able to level any legitimate criticism at the quality of special effects or compositing, in his movies, though. Hyperbolic to the point of nausea, check. Bad special effects, no. Not at all. Don't Like: I don't mind that there is humor, but the way the humor is used annoys me. There is plenty of comedy in Godzilla 2000, some of it based on bumbling, but it isn't as grating. There are characters who are bumblers in the '98 flick who are annoying bumblers instead of endearing bumblers. The interplay between characters that is supposed to be funny is sometimes funny, but more often than not it's pointless. If the film needed more seriousness it wasn't in the interactions between characters and the 'Zilla, but among the characters themselves. Part of this is in the direction of the actors, and part of it is in Devlin's script. But Emmerich settled for these performances, at least. And based on his other films, I actually think he asked for this. On purpose. Mistake. In the Japanese films there is always one foolish character, who fulfills the role of comic relief and is either the hero, or greatly assists the hero. Not here. They make a start toward that, and then suddenly all the characters are acting weird, and the hero turns out to be some Frenchman who likes Elvis Presley music. I could probably keep going with this section. I don't mean to imply that the film is not enjoyable. It's easy to enjoy it: just don't think about it while you watch. It's big and it's loud. The monster is well-done no matter what the whiny fanboys say. But it is not "Godzilla" in the way Toho originated it. This is a film that is worth one viewing as long as you either keep in mind that it's only a Godzilla flick, or if you don't think about it as having anything to do with Godzilla. The second approach is harder since that's what they keep saying while referring to the beastie. Whew! All the reviews are finally done. Ishiro Honda was still young, and had only 8 directorial credits before he took on the helm for Gojira. Honda accumulated 59 directorial credits over his career, which lasted from 1949 to 1993. Reputedly, his last work was to direct some segments of Dreams for Akira Kurosawa, who was a long-time friend of Honda's. Honda has Assistant Director credit for that movie. After the success of Gojira, most of Honda's later features were about Toho monsters, or at least in the science fiction realm. But for the greater part of the decade following Gojira, Honda was able to pursue other genres alongside the Toho fantasies. Honda was also a writer, with 12 credits in that field. Honda was not always in the spotlight, either, choosing sometimes to become assistant director, or to direct second unit, which might have given him an outlet for non-kaiju work. Mr. Honda died in 1993 just a few months before his 82d birthday. Terry O. Morse has co-director credit, and is listed after Ishiro Honda on the 1956 adaptation. He was quite an established Hollywood editor with an eventual career total of 65 editor credits. After editing films between 1927 and 1939, he broadened his skill-set, directing his first film in 1939. This was the first of five films he directed that year. He returned to the editing table in 1941, and was both directing and editing by the time he got the Godzilla project. Morse is both the director and the editor of the Jewell Enterprises release. He was known in Hollywood, according to David Kalat on the Criterion commentary, as a "film doctor," who could take films and make them better while using only or mostly the footage that was already shot. Thus, according to Kalat, that was one more reason why Morse was the perfect man for this job. Roland Emmerich was already quite successful as a blockbuster director whose works weren't always embraced by the critical community when he took on the movie Godzilla. He gained acclaim in 1984 when his student film opened the Berlin Film Festival. Emmerich has produced 23 films and has directed 19. There is a considerable overlap in the list. Apparently his entire oeuvre has been action fantasy/sci-fi in nature. His most recent release was White House Down (action fantasy) and he has plans to make two sequels to Independence Day in the near future. Emmerich's writing career began in 1979 with the first of two scripts which were produced, but not by him, and not directed by him. He has produced and directed most of his more successful films. Economically, Godzilla was not a failure. It is interesting that critical backlash alone killed the planned pair of sequels, one of which was already in pre-pro. I keep running up against the limit of 25 urls in a signature. Guess I'll have to slim down by merely linking to the banner farms for Round One and Round Two. That will save 18 urls right there. I haven't seen Godzilla in a while, but from the Emmerichs I do remember clearly (Stargate and Independence Day), he cuts less quickly than some of his contemporaries that he's compared to a lot (namely Michael Bay). I also find that he's pretty good at handling special effects without letting them overwhelm the action - his heavy reliance on them stems more from the genre he's working in. Also, wasn't the mayor in the movie named Ebert? I vaguely remembering Ebert jokingly complain that the mayor wasn't crushed by Godzilla. Yes. The mayor was Ebert, and his assistant was Gene. I think Stargate is probably the best R. Emmerich film to date. I've double-dipped on that one: DVD and Blu. I lean more towards Independence Day because it has better (or at least bigger) set pieces and a sense of humour, but Stargate is probably the most respectable thing he's done. I really like the production design and he shoots the desert pretty nicely. Jackson and the native kids are probably the most humerous things about Stargate, true. I'm trying to think if I've even cared for anything since ID4. I just looked at the filmography. Devlin once said that he and Roland like to make "popcorn movies." I think if that's true, I mostly don't care for popcorn movies. Of those I've seen (most of 'em) Moon 44, Stargate and Godzilla are the only ones I can muster much approval of, and not entirely with the Zilla flick. All the rest, 0-1 viewings have been enough for me. Yes? Southern Sea Salvage, Ogata speaking. What is it? An accident? The Coast Guard received a distress call. I'll have to cancel our date tonight. I'm sorry I can't go with you, but you can still see it if you hurry. It's a shame, but it's your job. What did this? -- Masaji! What did this?! It's no good! We didn't catch anything! It can't get any worse than this! Then...Godzilla must have done it. The old man and Godzilla, both relics from days past! Hey! What do you know about the old days?! If you all keep thinking like that, you'll all become prey for Godzilla! Ogata! I couldn't tell him* about us. All they can think about is killing Godzilla. Why can't they try to study him from a radiological perspective? It's an unique opportunity! Professor, I agree with them. Ogata, I do not take this matter lightly. Godzilla is something that no one in the world has ever seen, and only those of us in Japan can study it! But, Professor, that's no reason to do nothing while this monster ravages our country. Isn't Godzilla a product of the atomic bomb that still haunts many of us Japanese? Don't you think we should study what keeps a creature like this alive, regardless of the radiation it absorbs! All you want is to kill Godzilla, too?! Go away! Get out of my house! No, I shouldn't have upset him like that. No, Father has been like this. Emiko, give me a chance to see him again. If my device can serve a good purpose, I would announce it to everyone in the world! But in its current form, it's just a weapon of horrible destruction. Please understand, Ogata! I understand. But if we don't use your device against Godzilla, what are we going to do? Ogata, if the oxygen destroyer is used even once, politicians from around the world will see it. Of course, they'll want to use it as a weapon. Bombs versus bombs, missiles versus missiles, and now a new superweapon to throw upon us all! As a scientist -- no, as a human being -- I can't allow that to happen! Am I right? Then what do we do about the horror before us now? Should we just let it happen? If anyone can save us now, Serizawa, you're the only one! If... you use the device to defeat Godzilla, unless you reveal what you have done, who will know about it? Ogata, humans are weak animals. Even if I burn my notes, the secret will still be in my head. Until I die, how can I be sure I won't be forced by someone to make the device again? Will the only Oxygen Destroyer in the world be powerful enough to do the job? Its inventor, Dr. Serizawa, remains silent. All we can do now is pray for its success. Ogata, it worked! -- Both of you, be happy. -- Good-bye... farewell! I can't believe that Godzilla was the only surviving member of its species... But, if we keep on conducting nuclear tests, it's possible that another Godzilla might appear...somewhere in the world, again. This is Tokyo. Once a city of six million people. What has happened here was caused by a force which up until a few days ago was entirely beyond the scope of Man's imagination. Tokyo, a smoldering memorial to the unknown, an unknown which at this very moment still prevails and could at any time lash out with its terrible destruction anywhere else in the world. There were once many people here who could've told of what they saw... now there are only a few. My name is Steve Martin. I am a foreign correspondent for United World News. I was headed for an assignment in Cairo, when I stopped off in Tokyo for a social; but it turned out to be a visit to the living hell of another world. So, they believe that this Godzilla is responsible for all the ship disasters? The Oxygen destroyer must not be used! If we do not defend ourselves from Godzilla now, what will become of us? And what will become of us if a weapon, such as I now have, falls into the wrong hands? Then you have a responsibility no man has ever faced. You have your fear which might become reality. And you have Godzilla, which is reality. The menace was gone... so was a great man. But the whole world can wake up and live again. He is scum! As far as he's concerned, you're just a pair of breasts that talk. Hey, Joe! Gonna catch one of them little fish in the East River? I hope so.But you never know.I mean, today could be my lucky day. The only thing you'll catch is a cold. What did you, see old man? The radiation isn't an anomaly, it's the clue. How close did you get to the thing? Oh! Damn, uh! That's a negative impact, sir! I repeat, that's a negative impact! Negative impact? That's the goddamned Chrysler Building! What the hell's the matter with you people? You've caused more damage than that goddamn thing did! I can't believe it, uh... he did all of this and... we did nothing to him. Ah, that's not true. We fed him. A man in a suit wasn't beyond the experience of filmmakers around the world. Actors in gorilla suits were all over the place in the 1930s and 1940s. But these effects consisted of actors moving at normal speed, pretending to be about normal size. So when Eiji Tsubaraya realized that a man in a Godzilla suit was about the only way to get the film Gojira done in the available time, he was treading on new ground. He wanted to use stop-motion animation, the way that King Kong, and Mighty Joe Young and other films had been done. The Beast from 20000 Fathoms was done with stop-motion animation for the beastie. And Tsubaraya tried Gojira effects frame-by-frame, but stop-motion, as it turned out, would take much too long. Years too long for all the scenes where Godzilla needed to appear in the film. Tsubaraya estimated that it would take 7 years to complete the film with that method. Using a man in a suit was the only practical way to finish the film on time. Until the Classic Media 2-DVD set was released in 2004, I had never seen any footage of how Tsubaraya built his monster costume. It had never occurred to me that the special effects genius was having to invent everything as the crew went along on this adventure. A test stop-motion scene of Godzilla's tail swishing around is left in the film. It is a disappointment because there aren't enough frames, and it moves too fast compared to the creature's tail in all the other scenes. In other words, it becomes an example of one of the major difficulties faced by both types of monster-creation: neither stop-motion animation, nor "suit-mation" take place in real time during filming. A man in a gorilla suit is expected to move at his own speed. To create the illusion of great size and mass, the creators of the special effects in Godzilla (1954) over-cranked the film to slow down the motion on screen. How much to over-crank? No one was sure. And they had much less than a year to turn out this film. That would have been more than enough if they had known how to accomplish what they set out to do, but there was no one to ask. They had to test and invent. That was another drawback: making tests used up part of the budget for the film, as well as the time allotted to useful production. Another difficulty comes in designing the costume. It is easy to draw a bulky creature, but more difficult to make the relatively scrawny human shape fill out and move something real that would have more massive limbs and torso. All that bulk-building material no matter how lightweight, adds up and becomes hundreds of kilograms of weight that the operator has to manipulate. It is difficult for the operator to see out of the suit while on the set. It is difficult for the operator to understand how he has to move when all his motions will be slowed by several times. And there are limitations built into the suit. It crumples, it resists. Mostly, it makes accomplishment of the desired motion rather difficult. The first suit was too stiff. The actor inside could not walk in it. A second, lighter weight suit had to be constructed just so the actor inside the costume could move it. And it was hot inside, plus there had to be so much more light on the set in order to allow for running the film faster while shooting and getting the slow-motion appearance that they needed. So about three minutes of shooting at a time was all the actors could stand. In the ocean scenes the suit filled with water, compounding the troubles. But the viewer doesn't care about that. The person watching the film just sees what is on the screen, not how much work it takes to get it there. Tsubaraya had a lot of experience filming with miniatures from military films. That part was old-hat for him. Suit-mation was altogether new. Suit-mation caused the unexpected problems and delays. It must have seemed as if they would never get done. But the technique was so successful that all but one Godzilla film to date has used an actor in a suit to play Godzilla. The critters that Godzilla fights in all but a couple of the films are also man-in-suit technique. The films made since 1999 have used CGI to create certain underwater scenes, of Godzilla swimming, for example. Tsubaraya worked out the details, and in the subsequent 6 decades they have been improved upon. The more recent suits are actually quite impressive. It was invented in 1954, and has been tweaked ever since. Rick Baker used the method for most of the King Kong scenes in the 1976 remake of that film. Man in a suit still works! Even for a rampant giant tiramisu, as lobsterdance productions proved in 2011. The Gorilla Suits You. "men in gorilla suit with scantily clad females"
MOVIE GORILLA Halloween Costume. "MSRP: $8,200.00 - Price: $3,985.00 - You Save: $4,215.00 (51 %) - In Stock - Ready to Ship!" Also: "You searched for all products matching 'godzilla' No matching products were found, please try again." Adult Godzilla Costume. In case you want to be Big G in a cheap way on the night. For your very own G-junior. Hee hee. Cuteness. Making of the Godzilla Suit!. YouTube. HISTORY OF THE GODZILLA SUITS PART 1(SHOWA ERA) -- PART 2 (HEISEI ERA) -- PART 3 (MILLENIUM). YouTube. The Art of Suit Acting - Godzilla. YouTube. Film: Behind the Scenes – Monsters. From blog eleven-nineteen. Godzilla: On a stretcher, 1964. Haruo Nakajima autographed 8x10 Photo (The man in the Godzilla costume 1954 to 1972). "Out of stock" of course because there was only one photo! Character Class: Godzilla-Man. Friday, August 17, 2012 on Monstrous Television. 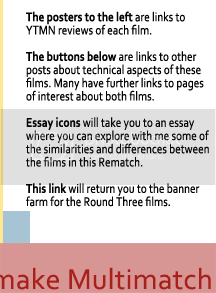 Selected for the embedded photos, not the content. Ark. family spends hours creating monster suits. "Actually, Rock Baker said, their Godzilla was an amalgamation of Godzillas. The Bakers then proceeded to display an amazing knowledge of Godzilla as they described which body part came from what movie." Godzilla Suit History. On Gory's Godzilla Zone. "Over the years, Godzilla's appearance has changed throughout his movies. Below is a list of links of all the suits used, and the years they were used. Click on each link to find out more, and see pictures about the suit used in the movie! Please don't ask me to include Godzilla '98, because he's not the real Godzilla." The Terrormisu! at vimeo.com. The Terrormisu! on the corrierino.